Power outages have a wide range of severity. A power outage goes from insignificant to very severe the longer it goes on. This majority of the disruption is from the interference caused to the food supply. Food stores will spoil during long power outages and many people will become reliant on emergency assistance. The larger and longer the outage, the more people will be vulnerable. A power outage is usually the “icing on the cake” for other disasters and emergencies, putting vulnerable people in stressful situations. Surprisingly, yes. While power outages in these scenarios are almost always a domino effect of another disaster or catastrophe, losing power indefinitely could and would change the world as we know it. Almost any disaster, attack, or accident can disrupt the power grid. Society’s reliance on power has grown by leaps and bounds in the computer age, and a long term disruption would have catastrophic results and change the world. While there would have to be another event preventing the return of the power grid to ‘normal’, power would be sorely missed and effect society more and more as it is missing. 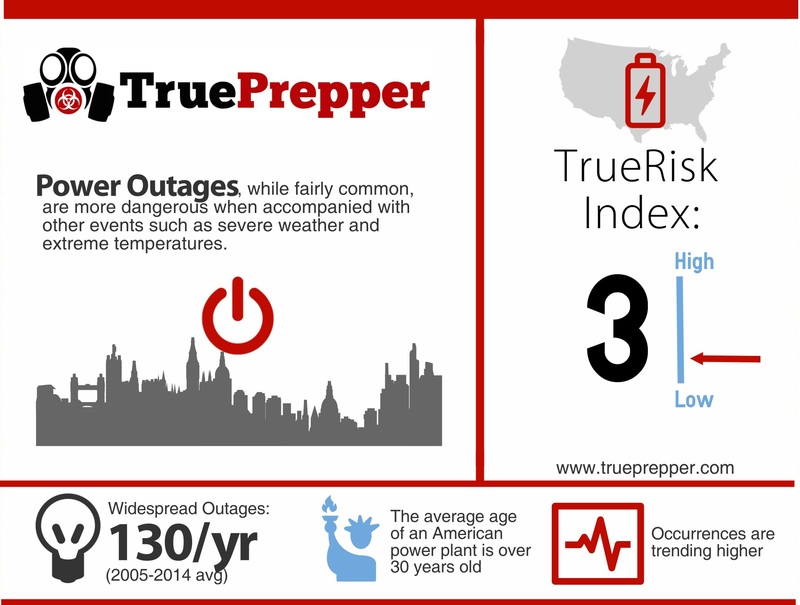 A power outage is a 3 on the TrueRisk index. A power outage, however, is a risk that you can mitigate to virtually zero. Generators, solar panels, and alternative power sources are all able to keep your power on while the rest of your region or world is in the dark. Those that have chosen to live ‘off-grid’ are already not reliant on power sourced from the ‘main grid’, which lowers their risk. There are still events that can cause a power outage regardless of your location or supply grid (looking at you, EMP). When determining your custom risk level, take a look at how often you get blackouts and brownouts on your grid and how your power is supplied. Exposed power lines can be repaired easier than buried lines, but have problems more often. Even if you are prepared and have your power situation covered, other’s unpreparedness will undoubtedly affect you as well. Looters and opportunists are usually on the prowl when the power goes out, and someone with power may be seen as a target. Before you get stuck in the dark, you should take a second to prepare for short term and long term power outages. A couple things added to your staple kits and you should be good to go. The one good thing about power outages is they rarely cause issues immediately on their own, so you should have plenty of time to implement your plan and use your kit. You will want to get to your survival kit and retrieve your candles, tea lights, and flashlights as quickly as safely possible. Once you are set up with a light source, you can move on to setting up any electrical workarounds you may have, such as temporary solar panels, generators, etc. Getting these online and making sure they are operational is important to understanding your limitations during the outage. When the power outage is over, and power is restored be sure to inventory lost food and medicines and note any potential damage from the power being out. Lost food and damage can be claimed on insurance in many situations, so a call to an adjuster could be helpful. Complete an after actions assessment to see how well your kit equipment and your plans worked, and adjust them as you see fit. Many times the power grid is fragile after being restored, so do not be surprised if another outage quickly follows the power restoration.